Blogger has added a new widget in their widget page. 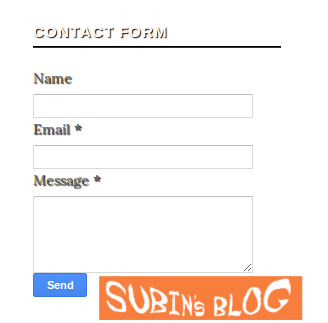 This widget is a Contact Me widget which allows blog visitors to contact you. This can be added in your blog sidebar or footer. In this tutorial I will tell you to how to add this to a blog page. <span style="font-weight: bold;">Replace the <span style="color: red;">Wheat color background text</span> above to your blog id</span>. See <a href="http://sag-3.blogspot.com/2013/06/find-blogger-blog-id.html" >this post</a> to see how you can find blogger blog id.